Wong argues for a new model for tragedy in this debut work of literary criticism. The stage tragedy was once at the artistic center of the culture, though much has changed in the centuries since Marlowe and Shakespeare gave the world Doctor Faustus and Macbeth. Wong argues that those dramatists succeeded in part because they had a model to work from: Aristotle’s Poetics. Essentially a tragedian’s how-to guide, Poetics has long since been rendered obsolete. Even so, a model is a valuable thing to have, and Wong seeks to provide a new one in the interest of returning the art form of tragedy to its former cultural relevance: “My term risk theatre derives from the notion that risk is central to the idea of tragedy. Risk theatre posits that each dramatic act is also a gambling act. Thus, the tragic occurs when risk runs awry, and risk theatre entertains by dramatizing this risk.” In an age of risk, when society lacks stability and to be heroic is to be a gambler, tragedies must find a way to dramatize the existential wager that people make every day. 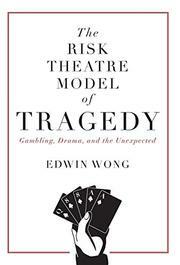 Wong outlines the structures and underlying theories of risk theatre, exploring how this model uniquely replicates the crises of our time. He also offers a historical overview of tragedy and analysis of the ways the genre functions as a medium both of entertainment and education. The prose here is academic but not alienating, and the author’s passion for his subject comes across in nearly every statement: “I propose that risk theatre prefers dangerous and uncertain settings not because, as some suppose, tragedy is an unhappy art, but because tragedy is a risk art. Because desperate times call for desperate measures, volatile settings increase the appetite for risk-taking.” The average reader can be forgiven for not giving tragedies much thought—that is part of Wong’s point—but the author’s diagnosis and remedy for the current state of theater are imaginative and quite persuasive. Playwrights will take a particular interest, but artists of any medium should consider Wong’s notion of the centrality of risk to the contemporary human condition. An ambitious, thought-provoking critique of tragedy in the 21st century.